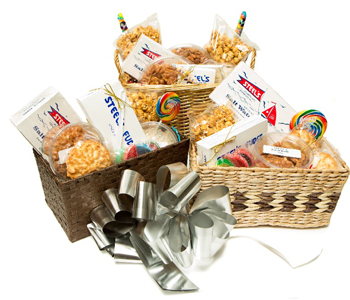 Order one of our gift baskets and you will be able to spread the good cheer of Steel’s Fudge to others! Give the gift of Steel’s to friends, family, business clients and others on any occasion including birthdays, holidays, weddings, anniversaries and special events. Let someone know that you care by selecting one of our handmade gift baskets, and that special someone will be filled with mouthwatering flavors and a great feeling (along with a stylish basket to boot)! To order one of our great gift baskets please call 609-345-4051 - Thank you! !